If we had to describe Halimeda's northbound passage in three words, they would be "quick," "comfortable" and "dry". Two days of pre-voyage preparation in port disclosed only one surprise: badly damaged luff tape on the staysail, apparently due to sharp edges inside the luff foil where the segments join. The sail maker was able to replace the tape quickly, so our departure was not delayed. 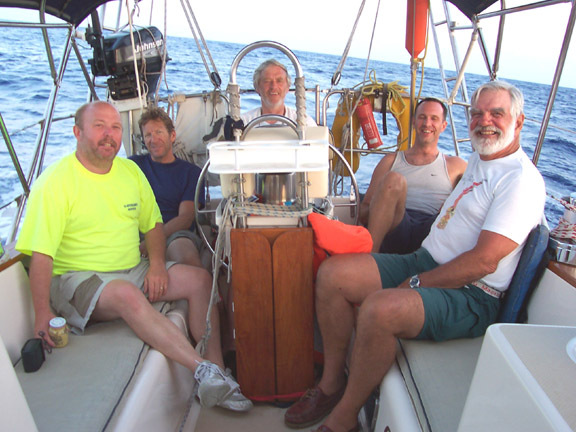 We stowed gear, inventoried equipment, rigged storm sails, trained on sea anchor deployment, reviewed emergency plans, developed a menu plan and provisioned the boat. We slipped out of Crown Bay Marina at 0555 on May 7 in defiance of the mariner's superstition that it is bad luck to start a voyage on a Friday. Sailing east along the south coast of St. Thomas to allow one of our crew to complete his Advanced Coastal Cruising qualifications, we anchored briefly at Christmas Cove on Great St. James Island (to satisfy another ACC requirement and to inspect the underwater hull in water somewhat cleaner than the marina). After scrubbing a few barnacles and a layer of soft growth off the prop, we were on our way north before the occupants of most of the other boats in the Cove were up and about. We motored north northwest in very light airs until the wind filled in at about 2100. Then we set sail and began some wonderful cruising. 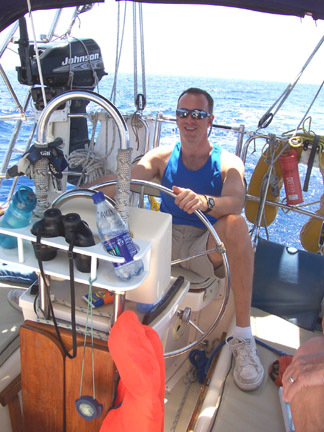 The wind was just forward of the starboard beam at 15-18 knots and Halimeda began romping along at a steady 6 to 7 knots. The seas were boisterous enough to cause "Ocean Motion" problems for several of the crew and eating was not a popular pastime. By Saturday afternoon, the seas were gradually smoothing out but the wind stayed fairly steady. Boat speed exceeded 9 knots on a number of occasions. 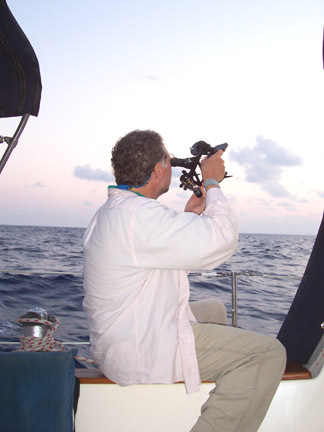 Skies were clear and stars were brilliant, and Venus was in one of its brightest phases at evening twilight, so there was plenty of activity in the celestial navigation department virtually every evening on the trip. Sunday was Mother's Day and we continued to enjoy a favorable wind direction at moderate speeds that kept the boat moving at a smart clip. 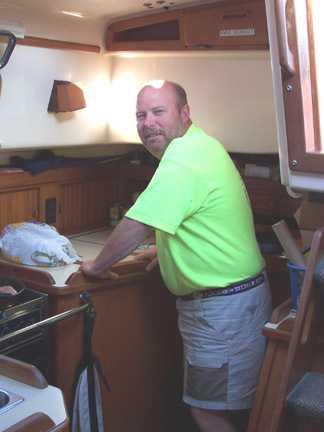 Just as we were about to enjoy a superb dinner of baked chicken breast with roasted potatoes and carrots prepared by crew member John Endicott, a fish took our lure. 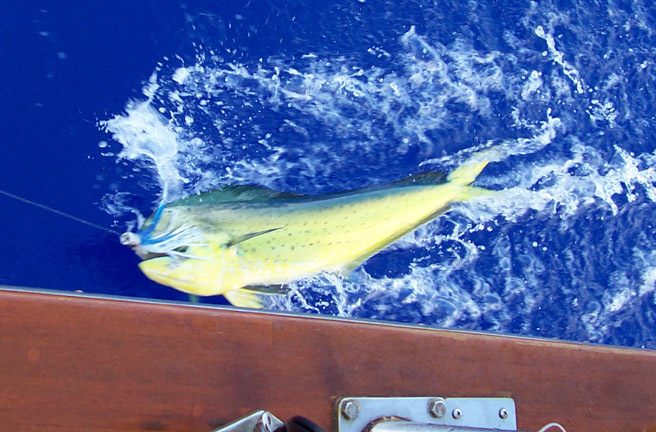 It proved to be a 32" dorado, which we boated successfully. It provided large filets that would be the featured item on the menu for Monday evening (accompanied by steamed fresh asparagus that was done to perfection -- John's talented hand at work again!). The fast and comfortable sailing continued through Tuesday night and into Wednesday morning. The crew was fully recuperated and we held daily training sessions in addition to standing our watches, which were organized differently than usual.. We stood 3-hour watches at night (2100-0600) and 5-hour watches by day, when there were usually other crew members on deck to give occasional relief if needed. With the wind drawing aft and getting lighter, we set the spinnaker before lunch on Wednesday and carried it until sunset. By Wednesday evening we were clearly running out of our favorable wind pattern and getting into the high pressure ridge the forecasters had said would lay across our track. It was time to turn on the engine. We motored through still air across calm seas all day Thursday. 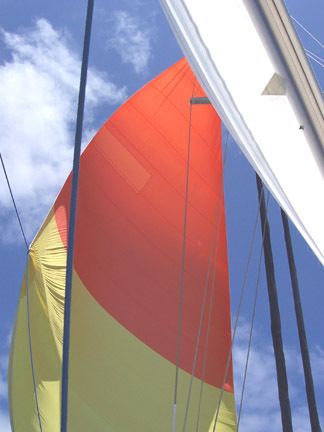 It was still calm and winds were light on Friday morning, but there was enough breeze to set the spinnaker again. In the puffs it pulled the boat along at better than 5 knots, while in the intervening lulls our speed sometimes fell below 2 knots. On the average, we were doing quite nicely, frequently enjoying a favorable current. On Friday night we encountered what in retrospect must have been a large unreported Gulf Stream eddy. The seas were choppier than they should have been with the existing winds and we were getting pushed southwestward at a knot or more in water whose temperature had jumped several degrees. After a few hours the seas settled down and early Saturday morning we experienced another region of choppy seas, this time with a current pushing us to the northeast. Saturday, May 15 proved to be a memorable day. 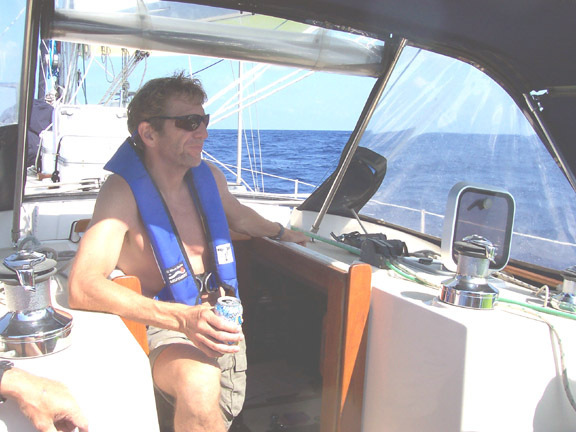 The wind filled in from the southwest, enabling us to resume our rapid sailing, broad reaching again. 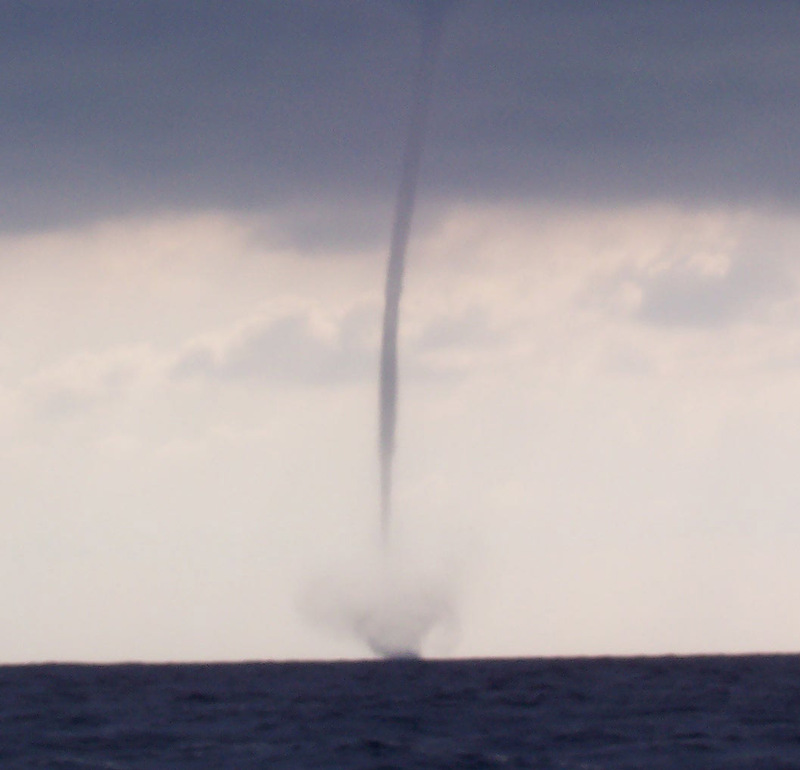 At 0800 one of the crew spotted a large waterspout (the marine version of a tornado) a few miles south of us. It proved to be one of the largest and most enduring waterspouts I have ever seen, lasting for nearly an hour. At one point it closed to within 3/4 miles of us and we could clearly see the water being violently ripped from the sea surface and flung several hundred feet in the air around the base of the long tube of rapidly spinning air and water -- we motorsailed at cruising power to keep our distance! The tubular structure of the spout, reaching up to a distinctive funnel-shaped protrusion from the bottom of the dark cloud overhead, was very evident. The spout seemed on the verge of collapse several times, but each time it regained its form and strength until it finally moved off to the east and dissipated. Not too long afterward we were visited by a pod of playful dolphin who spent 15 minutes frolicking around and under our bow as we sailed along at 6-plus knots. 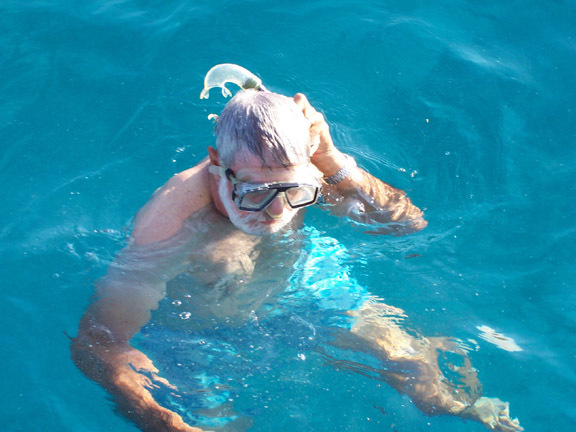 By mid-day we were firmly in the Gulf Stream, with water temperatures rising above 80 degrees, the water a distinctive deep blue color and a current that pushed us on our way. The combination of wind and current produced speeds over the bottom that once reached 10 knots. 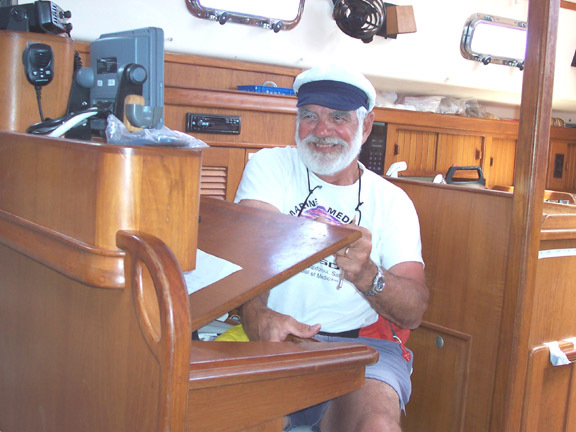 Late Saturday afternoon we passed out of the Gulf Stream and into the cooler, greenish water over the continental shelf. The southwest wind continued to push us along our track, and just before midnight we sighted the first evidence we were approaching the coast: flashes from the Currituck Beach lighthouse. By daybreak Sunday, the buildings of Virginia Beach were visible and we sailed into Chesapeake Bay at about 0815. 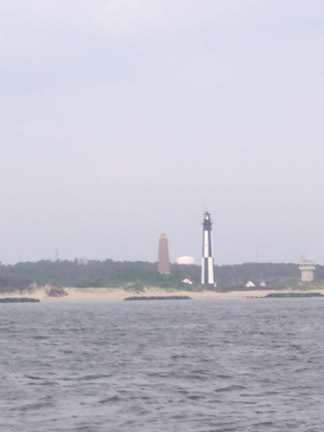 The southwest wind persisted and we were able to sail all the way to the Chesapeake Bay Bridge-Tunnel. 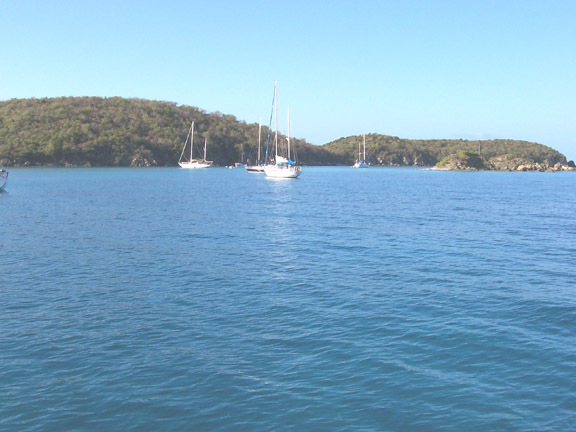 From there we motored to our destination at Taylor's Landing Marine Center in Little Creek, where we moored at 1045. It was a remarkable voyage. The rhumb line distance from Christmas Cove to the mouth of Chesapeake Bay is 1280 miles. 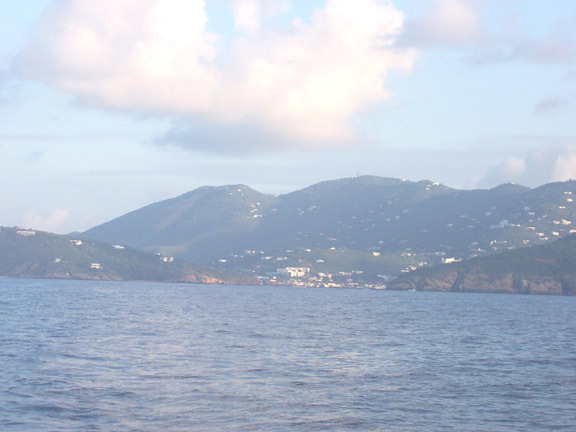 Our trip, which included our travel along the south coast of St. Thomas, several hours of maneuvering for activities such as compass calibration and man overboard drills, plus the distance from the mouth of the Bay to Taylor's Landing, totaled only 1311 miles on the ship's log. 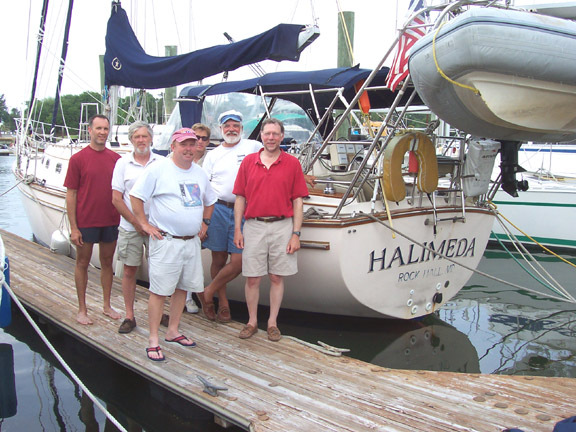 With 9 days, 5 hours of elapsed time, we averaged just a shade under 6 knots, an outstanding performance for Halimeda. Aside from a very brief light sprinkling shortly after the waterspout incident, we had no rain during the trip. The only down side to all this is that the student crew didn't get any exposure to the more demanding wind and sea conditions that are typically encountered at some point on a passage of this length. 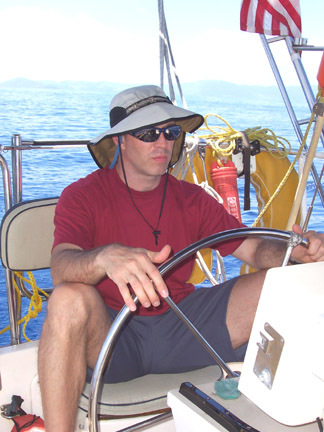 While it was a wonderful experience, it was hardly a normal ocean passage.